The National-Socialist German Workers’ Party, first called Nazis to liken them to backward, unlearned workers by those resisting the movement, were behind abuse and genocide on an unprecedented scale. In addition to the tragedy are many odd, puzzling, and occasionally conflicting facts and hidden truths that even the most casual student of history should know. Yet even the well-studied may not be aware of the facts we now uncover about the Third Reich itself. This list is dedicated to civilian victims of all cultures of collateral damage, violence, and war crimes. What is the first rule of poisoning a victim in a Hollywood movie? Don’t drink the poison yourself. While Adolf Hitler unleashed his murderous regime, aided and abetted by numerous strategic and opportunistic henchmen and conspirators, the most disdainfully remembered of military aggressors and war criminals actually had the pseudoscientific and absurd racist laws of Nazi Germany written in such a way as to exclude the possibility of Adolf Hitler being persecuted as a Jew if he were somehow found to be of Jewish heritage. What exactly was going on in his mind? An English article had been published in 1933 by the London Daily Mirror which depicted a gravestone located in a Bucharest Jewish Cemetery. In the graveyard was a memorial to a man also named Adolf Hitler. In addition to the name on the stone, the relic also happened to include inscribed characters that were of the Hebrew language. In his fear–resulting from the surprising discovery of the unrelated yet uncomfortable namesake–Hitler had the Reich laws that defined a Jew (under Nazi policy) written to exempt Jesus Christ and, just in case there was a connection, Adolf Hitler himself. We already know that the Nazi regime is notorious for having participated in aggressive military actions either to add territory through hostile acts, address conflicts and grievances, or persecute identifiable groups. One of the victims of Nazi aggression was the Netherlands, a country unfortunately remembered for being violently invaded by Nazi-backed German forces while brutal oppression of minority groups ensued. However, what might come as a surprise is that while Germany invaded the Netherlands, the man doing the yakking behind the Nazi War machine, propaganda Minister Joseph Goebbels, was actually born to a Dutch-born Catholic woman named Maria Catherina Goebbels, who had married his German father. Goebbels suffered from significant disability stemming from contracting polio that lasted throughout his life, and was also known for an exceptionally disturbing ability to make hate speech a matter of popularity to what some might consider a surprising degree. Despite his role as perhaps the most vocal and strident of anti-Semitic supporters of Hitler, the man who had an exceptionally distressing dedication to promoting Hitler’s regime received much university training under a revered Jewish professor known for his mastery of the works of Goethe. 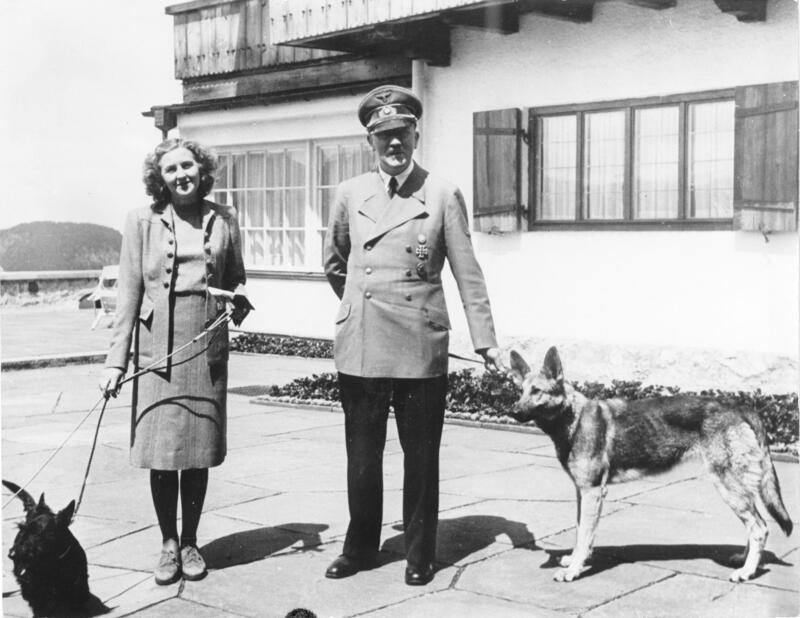 Eva Braun remains a mysterious secret to a fair degree, primarily due to the fact that her very existence and presence in the Fuhrer’s life was a secret of the Nazi state. That secrecy was due to the fact that Hitler was supposed to be married to the Reich, according to twisted Nazi doctrines. Of particular interest is that Hitler’s romance with Braun is not the usual romantic pursuit. After becoming fascinated with Braun–some would say smitten–Hitler studied her in a rather creepy way, and then proceeded with his interest in her by ordering SS investigations into her heritage to see if she happened to be of Jewish background. Once Hitler was satisfied this possibility was not the case (as far as the results of the investigation were concerned), the romance between the Austrian-born, German nationalist fanatic and the German woman carried on without “issue.” That is the danger of courting a Nazi leader: the reality that one may have fanatical background checks run behind your back. Over the course of Braun’s short life with Hitler, she seemed to have a full range of benefits of domestic life when it came to material provisions, possibly due to her two suicide attempts. The mad policies of the Third Reich were enabled by a curious mix of “strongmen”: intimidated common folk complying with aggression and violent sanctions, criminals seeing a chance to take a piece of the action, and opportunistic everyday villains and lackey weaklings who did the bidding of their fanatical higher-ups. In a bizarre twist of irony, the image selected to represent “The Ideal German Soldier” of Nazi propaganda ideals on a widely flaunted Nazi poster was one of a young German-born man named Werner Goldberg, who had become a German Wehrmacht soldier after entering army service because–surprise–neither he nor his father could obtain employment because of their Jewish heritage. Goldberg himself was half Jewish. Despite that, Goldberg entered the army and participated in the invasion of Poland, and was photographed by a German army photographer who passed the photos on to a large Berlin news outlet. When Hitler saw the image, he was delighted. Forced out of the army when his Jewish identity came to public light, Goldberg and his father escaped from a hospital. Goldberg survived until 2004. Hitler may have been history’s worst mass persecutor of Jews, yet few people know that he and the rest of his family were taken care of medically by a Jew throughout his childhood. 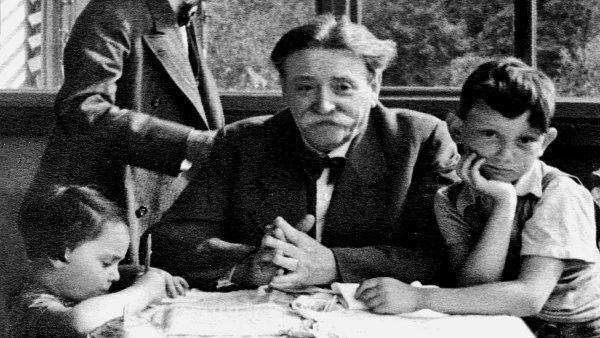 Dr. Eduard Bloch was the Hitler family’s physician, and such was the regard in which Hitler held him that he had arrangements made to ensure his protection among the senseless horrors of the Holocaust Hitler and his consorts were perpetrating. Born in what is now part of the Czech Republic, Bloch treated Hitler as a child and also was the doctor to his mother, Klara, caring for her as she died of cancer. Hitler made a postcard and gave the doctor gifts the year after his mother died. Later, as he established the virulent Nazi regime, life began to get hard for Bloch under the blanket persecutions against Jewish people. As various losers joined Hitler to promote nationalism and glorify themselves at others’ expense most opportunistically, Bloch wrote to Hitler to ask for some reprieve. Hitler had described the doctor as a “noble Jew.” In response to the doctor’s request, Hitler had Bloch put under Gestapo protection, allowing the doctor and his wife to remain in their home before immigrating to the United States after the end of World War II. Emil Maurice is notorious as one of the founders of the SS who formed a close relationship with Hitler prior to World War II. Helping to produce Hitler’s book Mein Kampf, Maurice also served in a leading bodyguard role and was known as one of Hitler’s most trusted chauffeurs in his career. Maurice was the first of three chauffeurs engaged by Hitler, and also played a leading role in early revolutionary activities that grew the weight-throwing ability of the Nazi party and spawned the thuggish SA and the brutal SS. The catch? Emil Maurice, a trusted confidant of Hitler, was actually in fact partially of Jewish descent. The virulently anti-Semitic Heinrich Himmler wanted Maurice out, but despite raging anti-Semitism, Hitler had him protected and he remained in service. The work of Maurice while in prison with Hitler for attempting revolutionary violence involved writing down lots of hate speech against those of Jewish heritage. All conflicting connections aside, Maurice’s violent agitation was unmitigated as he fed the growth of the Nazi party. What’s most ironic about the Nazi regime? Some of their “shoot yourself in the foot” mistakes where they held up fine Jewish people, members of an identifiable group against whom they enacted their most egregious hate crimes as representations of their “Aryan” ideal. While Werner Goldberg suffered Jewish identity-based persecution but was later accidentally held up by the Nazis as a symbol of their very physical and military ideal, another Jewish person had their image unintentionally used by the Nazis to depict their vision of an “Aryan” baby as part of their senseless propaganda machine. Born in 1934 in Berlin, a baby girl named Hessy Levinsons Taft had her image entered in an “Aryan” baby photo contest by a photographer who wanted to effectively “troll” the Nazis. While the stunt certainly played the Nazi party, it is also true that the action may have put the baby’s safety in danger from the brutal regime. The baby’s image was selected by Goebbels himself as a winning photo. The child survived the war, left Germany, and at least as of 2014 was a chemistry professor working in the United States. Rudolf Hess is one of the most significant yet mysterious figures in the history of the Third Reich. Hitler’s exceptionally devoted deputy, Hess was, firstly, not born in Germany but in Alexandria, Egypt to German parents. One of the earliest proponents of German aggression in the Second World War and a close compatriot of Hitler, Hess helped him prepare Mein Kampf while they were imprisoned together. Becoming a leading Nazi party member, deputy, and secretary to Hitler, Hess developed concerns in 1940 over the German plans to engage in a war of aggression on both the Western and Eastern fronts. By 1941, Hess succeeded in arranging a plan to engage in negotiations to break off hostilities with the British. This plan involved getting flying lessons beginning in 1940, received from no less than the chief test pilot at Messerschmitt. After receiving flight training, in May 1941 Hess got into a Messerschmitt Bf 110E-1/N and flew to Scotland where he attempted to negotiate with the British and ended up being imprisoned for the rest of the war. He ended up serving the remainder of his life in prison following findings of guilt in the Nuremberg trials for fostering a war of aggression. Hermann Goering is known as one of the worst offenders of the Nazi regime, standing behind the aerial assault on Britain, the Gestapo, and anti-Semitic statements and directives that cost countless lives. However, what is less known is that he had a brave and ardently anti-Nazi younger brother who went to significant lengths in a bid to save Jews targeted by the Nazis. 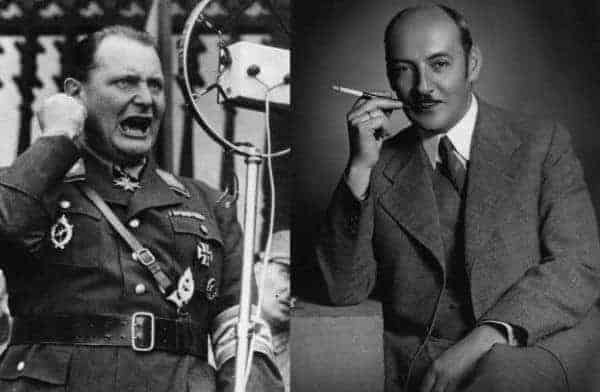 Albert Goering drew on his profound dislike of the violent persecutions carried out by the Nazis and used the Goering last name to obtain exit permissions on travel documents, allowing escapes from Nazi Germany. An even cleverer tactic was to request labor from concentration camps, send trucks, and then have the prisoners released once taken away. Interestingly, it has been suggested by some that Albert Goering, said to have a different look from his brother, might possibly have been the child resulting from an affair between the childrens’ godfather, a Jewish physician named Hermann von Epenstein. The boys’ mother, Fanny Goering, was often alone due to her husband’s travels, adding to the rumors. Throughout the war, Albert engaged in many efforts to rescue prisoners, which caused Gestapo reports to be filed against him. However, his family connections allowed him to escape and continue the rescues. All “facts” are illegitimate and based on falacies.. In faxt the ss was founded by jews and had 100,000 jews in its ranks and the Wehrmacht had over 250,000 jews in its ranks..